In Lesotho, where fashion is still a relatively young industry, two Basotho designers have identified a space in the creative scene. Phutheho Ranooe, 29, and ‘Maleeto Monyau, 30, are House of Thethana, a textile design duo who specialise in an innovative assortment of futuristic prints for men and women. The graphic designer friends met in 2004 while at university in South Africa. Though they went their separate ways after transferring out after a year, they’d soon find out that they were neighbours in a small town north of Maseru’s central business district (The New Age; 2015). We recently caught up with Phutheho and ‘Maleeto to get a feel for what their House of Thethana is all about (The New Age; 2015). Lineo Segoete for Okayafrica: Can you give us some background on your products, conception and name? 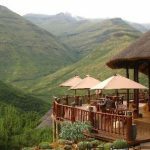 House of Thethana: House of Thethana intends to offer a unique Lesotho experience through textile designs inspired by the Mountain Kingdom. The textile pattern designs will be printed onto fabric and converted into products such as cushions, stationary, aprons, curtains, furniture, clothing garments and fashion items such as bags. The idea is to give clients the opportunity to own unique products which will feature a distinct point of view, yet can be customized to suit their specific tastes (The New Age; 2015). House of Thethana is a business idea conceived in 2006. We were constantly inspired by Lesotho’s culture and dynamic landscape and thought it would be wonderful to celebrate it through design by creating lifestyle items inspired by everything about the country (The New Age; 2015). Initially we conceived the name because we wanted to highlight womanhood. Hence the name House of Thethana. But as time passed we realised that it’s not only women we want to celebrate, but all people (The New Age; 2015). What do you envision for the brand? We want to become a global textile design brand contributing to the economic development of Lesotho. Through our business we will create employment and represent Lesotho globally (The New Age; 2015). What motivates you, particularly in an environment such as Lesotho? We are constantly inspired by Lesotho’s culture, her people and breathtaking landscape. Our environment feeds our creativity and we want to give back to it by expressing its beauty through design (The New Age; 2015). House of Thethana is actually not a fashion brand, but is instead a lifestyle brand with a specific focus on home decor. Currently no one in Lesotho has explored home decor in a similar manner. However, the one aspect of fashion we have explored thus far is fashion accessories through merchandise such as bags, umbrellas and hats (The New Age; 2015). You have a background in graphic design- how does it influence your products and vice versa? It contributes greatly to how we properly apply principles such as use of colour and space in a design. Also, most of our designs are started off digitally before they can be translated into textile, a critical step which helps us to stretch our imaginations. Our products are intended to express creativity, pay homage and push barriers all in one. Without an education in graphics this might have proven a little bit harder so it helps make our job a lot easier and natural. More-so because design and creativity are at the core of both our worlds and graphic design itself (The New Age; 2015). So far for locals, they can be found at the Basutholand Ink kiosk at Pioneer Mall. Otherwise, people can contact us directly or via our Facebook page to place an order (The New Age; 2015). Lineo Segoete is the co-director of Ba re e ne re literary arts in Lesotho and a freelance writer and wanderer governed by creativity. Follow her on Twitter and Instagram. Keep up with House of Thethana on Twitter and Facebook (The New Age; 2015).